Su Tong is one of the most famous Chinese writers, nine books have been translated into French. He is a favorite of the Chinese public established with “Raise the Red Lantern” (3), the well known Zhang Yimou’s film, adapted from one of his novels. 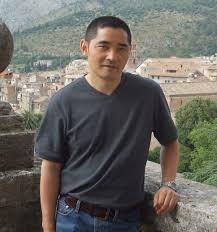 Su Tong was born in 1963 in Suzhou; a family of four, his father an executive, his mother a worker, have no connection with the literary and artistic circles of the city. He studied Chinese literature at Beijing Normal University and after a short period in a high school became the editor of the magazine “Purple Mountain”. He wrote novels that depict very different periods: the Chinese emperors (“The Myth of Meng,” a book to forget and “I am the emperor of China,” a superb fiction), the end of the empire (“Raise the Red Lantern”), the first years of the Mao period ( “Made up Faces” and “Opium family”), the period of the war with Japan ( “Rice”, another great novel), the Cultural Revolution ( “The boat…”) and the transition to capitalist China ( “Tale of the Siskin”) between 1980 and 2000. He is less known for his short stories that are essential in his work. Two collections have been translated: one into French, “Paper Ghosts” (4), the other in English, “Madwoman on the Bridge” (5). Other translations have been published in magazines and now with Ebook, a solution perfectly adapted for short stories or short novels. Last May, in English and Kindle format were published “Another life for women” and “Three lamps” (6). A major street, the area where the writer organizes the lives of his characters; it helps to develop them, it provides a refuge. As the grandfather, the hero of the book, it is a link between the past of socialist China and an ultra capitalist present. The history and political developments have a limited role, but as a consequence of them, grandfather “lost his spirits”. His own grandfather was a warlord, his father a traitor to the nation. The tombs were razed, pictures burned; only remains a flashlight containing two small bones that grandfather is searching with a spade even in the mental hospital. His madness is a part of his history, he searches the past of a wealthy family in this Cedreles street. His madness is not aggressive or gloomy, it generates a large share of the very effective humorous episodes of the book. He is a link between past and present, but also between members of the trio: his grandson Baorun, a clumsy character in love with Princess, an orphan adopted by the gardener of the hospital and Liu Sheng, a cynical seducer who rapes her. Madness is a way out in the family decline for grandfather and for a failed love story for Liu Juan, the sister of Liu Sheng. Madness allows the grandfather to remain the most human character and even tied with ropes by Baorun, the most endearing. Like most books by Su Tong, this is not a political novel: some references to the business around the hospital and Liu Sheng; little tricks by small crooks. The “big” capitalists are hardly despised: President Zheng turned insane and Princess will benefit from this situation. Pang, the rich Taiwanese, has a Christian woman in a wheelchair, this is almost an excuse for fathering a child with Princess. The past and memory are essential; the trio is bound by its common past and all of them are making efforts to come into line with this past; Baorun alone will not succeed. A very simple construction, generally chronological; not too many characters and this Cedrele street will not provide too many neighbors. The sequence is clever but one does not feel that Su Tong is aiming at an almost scenario as in “I am the emperor of China” ( 8). The descriptions are short and precise, the author focuses on the details he finds significant. The quality of this novel is its style, its humor, its narrative more than the plot or the characters; grandfather, alone, is the backbone of many scenes. We must emphasize the humor of this text and in particular situations or the action of some characters; we are delighted page after page. Other episodes are quite surreal: grandfather digging the flashlight, the anniversary of President Zheng, Victory the horse of Qu Ying, the lover of Princess, all these episodes enchant us even if they are not essential to the development of the book. 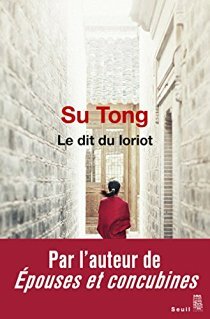 (1) Su Tong, “Le dit du loriot” (“Tale of the Siskin”), translated into French by François Sastourné; Le Seuil, September 2016, 368 pages, 22 euros. (2) Su Tong, ” La Berge” (“Boat to redemption”), translated by François Sastourné; Gallimard-Bleu de Chine, 2012. 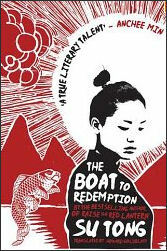 (2) Su Tong, “The boat to redemption”, translated by Howard Goldblatt; Doubleday, 2010. (3) Su Tong, “Wives and Concubines”, translated into French by Annie Au Yeung and Francois Lemoine; Flammarion, 1992. (3) Su Tong, “Raise the red lantern”, three novellas translated by Michael Duke.William Morrow, july 2004. (4) Su Tong, ”Paper Ghosts”, translated into French by Agnes Auger; Desclée Brouwer, 1999. (5) Su Tong, “Madwoman on the Bridge” Transworld Publishers, 2008, 304 pages. (6) Su Tong, “Another life for women” and “Three lamps”: Simon & Schuster, May 2016. Kindle. (7) “A Conversation with Su Tong” by Shu Jin, translated by Denis Mair; Chinese Arts and Letters, vol 1, March 2014. 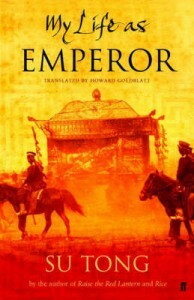 (8) Su Tong, “I am the emperor of China”, translated into French by Claude Payen. Philippe Picquier 2005. (8) Su Tong, “My life as emperor” ,translated by Howard Goldblatt; Hachette Books, 2006.